HD552 Material: 100% Polyester Size: 110" L, and 5 1/2" W at the widest point 100% smooth weave polyester with clean finish seams. Double layer fabric is fully lined. 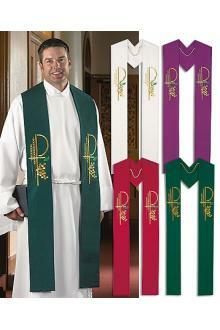 Reinforced embroidered stitching. Back cord keeps stole comfortably in place. 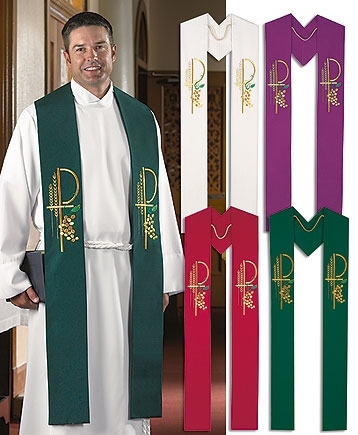 Buying all 4 stoles will provide appropriate wear for the seasons of Lent, Pentecost, Confirmation, Epiphany, Ordinary times, Advent, Christmas, and Commemoration Sundays.